Store the kit at 2–8°C. Under these conditions, the kit is stable until the expiration date (see label on the box). 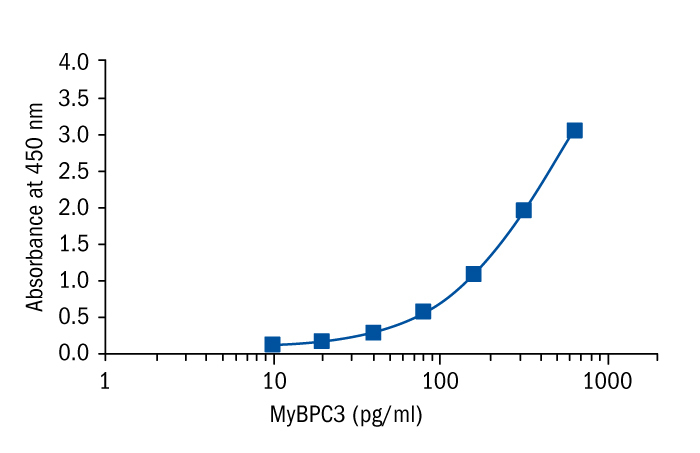 Myosin binding protein-C (MyBP-C) is a modular thick filament protein belonging to the intracellular immunoglobulin (Ig) and fibronectin (Fn) superfamily. Three isoforms of MyBP-C are known in adult muscle: slow skeletal, fast skeletal and cardiac. These 3 isoforms share a similar structure consisting of several immunoglobulin and fibronectin modules and a myosin binding site in its C-terminal immunoglobulin model. Cardiac MyBPC (cMyBP-C, MYBPC3) is a 140 kDa structural protein that is localized in the inner two-thirds of the A-band in the cardiac sarcomere. The cardiac isoform is present only in the heart. MyBPC3 stabilizes sarcomere structure and regulates actomyosin cross bridge formation. Structurally, cMyBP-C contains 12 domains. The three sites (Ser-273, Ser-282 and Ser-302) in cardiac-specific M-domain are differentially phosphorylated by the enzymes (protein kinase A - PKA, PKC, Ca2+-calmodulin-activated kinase II (CaMKII), PKD and the 90-kDa ribosomal s6 kinase). Phosphorylation of cMyBP-C regulates myocardial function and confers resistance to proteolysis, preserving cardiac function post-Myocardial infarction (post-MI). Dephosphorylation at Ser-273 and Ser-282 facilitates cMyBP-C degradation and release of a 40 kDa N-terminal fragment (C0C1f). This C0C1f fragment is pathogenic within cardiac tissue and it is released into the circulation. C0C1f reduced cell viability, altered Ca2+ handling, and significantly decreased sarcomere length shortening and the velocities of contraction and relaxation by inhibiting actomyosin function. It was later established in vivo that the C0C1f fragment could cause cardiac dysfunction and heart failure. Recent data implicate circulating C0C1f as having clinical utility and potentially serving as a novel biomarker for the early diagnosis of MI. Plasma levels of cMyBP-C are significantly elevated in MI samples. cMyBP-C levels increase from baseline at 3 hours after MI and peak at 6 hours. Moreover, cMyBP-C may be more useful than the gold standard biomarker cTnI, which is normally detected 6-12 hours after onset of MI. Importantly; it was shown that plasma cMyBP-C levels are significantly raised in humans with hypertrophic cardiomyopathy undergoing transcoronary ablation of septal hypertrophy.